During the winter months of inaction, Civil War troops resorted to a variety innovative ideas to pass time. Checkers, chess, backgammon and several card and dice games were extremely popular. Most game pieces were made of wood or lead. These lead pieces appear to be made of 69 cal lead musket balls, pounded out flat. Half of them has an impression stamped into it. All 30 pieces were dug in one hole. 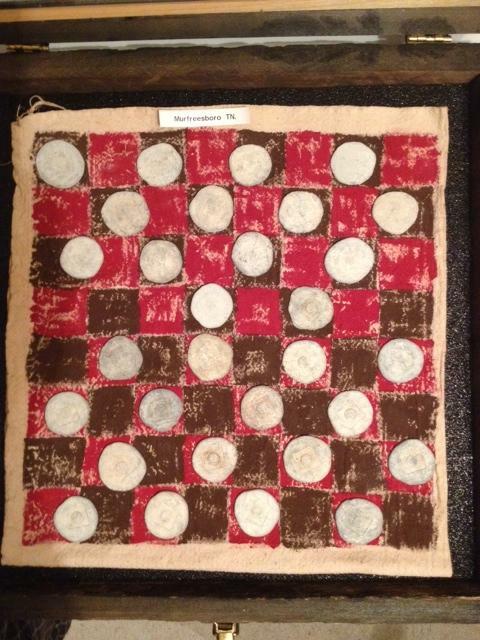 I made the checker board out of an old feed sack, to resemble what one would have looked like back then. This 30 piece set was dug by a friend of mine near Murfreesboro TN. in a Confederate winter camp.